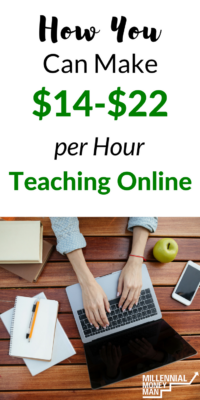 VIPKID Review: Can You Actually Make $14 - $22 Per Hour Teaching Online? VIPKID Review: Can You Actually Make $14 – $22 Per Hour Teaching Online? As a former high school teacher that is married to an elementary school teacher, I understand more than most how hard it is to make extra money when you're working full-time with crazy hours. There's a misconception out there that teachers have tons of extra time every day because they have the same schedule as the kids. If you're a teacher, you just rolled your eyes reading the last sentence! Between lesson planning, grading countless papers, homework, and projects throughout the year, and THEN trying to juggle what your administrators want vs. what is actually possible in the classroom – a nifty side hustle sounds impossible. But what if there was a side hustle that was perfect for teachers? That's where VIPKID comes in. In short, VIPKID is a company that connects its teachers with young Chinese students with the goal of helping them learn English. Believe it or not, I actually didn't learn about VIPKID online. One of my best friends (also a band director) is married to an elementary school teacher. One day we were talking on the phone and he mentioned that his wife was making great money on the side by teaching kids how to speak English. At the time I didn't think much of it, but after he mentioned it again and how much success she was having, I realized that it was something I really needed to check out! I sent some interview questions over to his wife to get an inside scoop on how well it really works, which I'll get to a little later in this review. But first, let's walk through the basics of VIPKID and answer a few questions you may have. How do you teach for VIPKID? The requirements to teach for this side hustle are actually pretty relaxed. You have to have a bachelor's degree in any field, and experience teaching children. But the second part of that equation is the surprising one. When I initially saw VIPKID, I assumed it was only for teachers. But they use the term “experience teaching children” pretty loosely. Volunteered at the YMCA? That works. Did you raise your own kids? That works. Teach Bible school? That works. Basically, you just have to have some type of experience “working” with kids. All in all, that's pretty broad and opens this side hustle up to a lot of people. All you have to do to get started is apply here. What are the steps for teaching with VIPKID? How much does VIPKID pay? You can start the VIPKid process here. My friend Candace was cool enough to volunteer her time to answer some questions I had about her experience working with VIPKID! She is a full-time elementary school teacher and also has two young kids at home. She gave some great insight on what the scheduling, application, and overall experience working with VIPKID look like. So how hard was the actual application process for VIPKID? Was it as easy as they make it sound? The application process was super easy and as long as you have the required experience (working with kids) and a bachelor's degree, it seems they reach out to everyone. However, the hiring process was not as easy. You do a phone interview which is literally just them confirming what you entered on your application. Then they tell you based on your experience what your hourly pay will be assuming you get hired. From there if you agree they send you information for 2 mock lessons that you will teach online by video to a hiring agent who will pretend to be a Chinese child. One lesson will be a beginner student (no English) and the second will be an older student who is further in the program. They send you the lesson components so you can study them and prepare/plan. There are a bazillion videos out there that people who have made it through have made with helpful tips. You sign up for a time to do the mock lessons. It is timed and that is a big component they are looking for you to adhere to. After the first lesson, the hiring agent will give you some pointers and then you will do the second. They give a bit of feedback and that's it. Then you wait to get an email to see if they chose to hire you. It took me two days to hear back. Then you have to log in to do the background check which takes a few days to come back as well. While waiting for background check you upload your ID, payment information, tax forms, diplomas, etc. Then you create a profile with a couple of pics and a 12-second video for parents to view when selecting their teachers. Once you're ready and good to go, it does take two weeks to a month to really start having regular lessons where your schedule fills up but it does happen, sooner for some than others. VIPKID says that teachers can make $22 per hour. Is that what actually happens or is it less? It seems to be possible for $22 per hour. I get $21. I know the fact I have a master's degree helped and I believe the reason I did not get the full $22 is that when they asked about my teaching certifications (which is not a requirement) they asked if I was ESL certified, which I am not. So I am assuming that would have been the extra dollar. Now the rate is hourly but each class you teach is 25 minutes with a couple of minutes included for feedback so that really is only half of the hourly rate. So you have to teach two classes to make the hourly rate. I guess, basically, you have to teach two classes to make that hourly rate. So really per class, its $11. 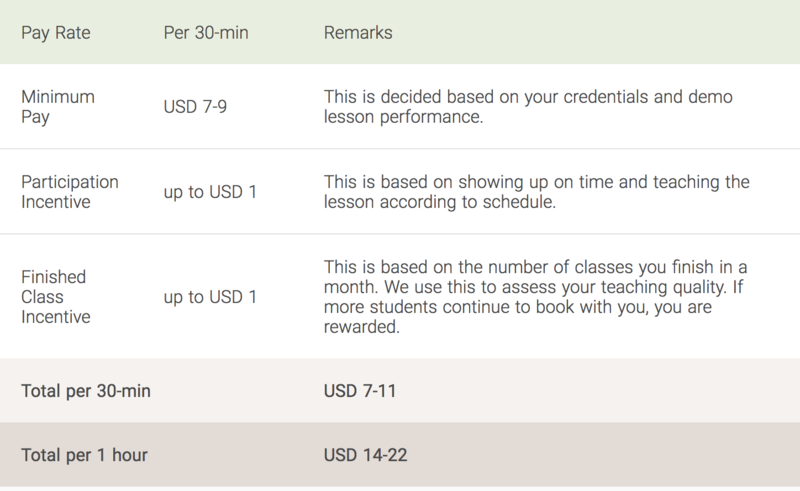 Also, to make the full hourly rate, you need to plan on teaching at least 45 classes per month. Part of that $11 dollar per class is broken up into what you get for teaching the class, then a “bonus” dollar for completing the class, then an additional bonus dollar per class completed over 45. I know it kinda doesn't make sense but once you get into the swing of things it does and it's so easy to complete 45 classes that I never really worried much about it. The company's computer system is really awesome and well done/easy to use. You are able to find all classes you taught and how much you were paid for, etc. Very organized and user-friendly. You get paid around the 15th the following month. Are the kids easy to teach or is it a pain? The kids are the best! They are serious students and seem excited about the concept of learning online. They are dedicated and so much better behaved than American students. All of them take piano, and many do a sport or dance and this is one more layer of their education they are taking lessons for so they are good students. I will say in about every 20 students I teach, I might get a “dud” who just is not interested or a little one who is off task but they are few and far between. They really get attached to you. I've had kids give me flowers (only on screen) and write me sweet messages. The company also does a lot for teacher appreciation and will send you little audio clips or videos to celebrate milestones like 100 lessons taught or Chinese teacher appreciation, Thanksgiving, etc. Are their parents there to help? So almost all parents are present. Some sit right with the kid, others are just in the background or doing their own thing but you can almost always see or hear them. There are also many who log in from another computer and view the lesson live. Others will shout out to their kiddos from another room from where they are watching to “help” their kids, thinking they can't be heard. Its funny but for the most part, they really are there to help or just observe. Some like to talk at the end of the lesson if there is time, which is really cool. Some want their kids to be perfect and actually interfere with the teaching process because they are constantly correcting their pronunciation but wrong at times so that's a little frustrating. My experience overall with parents has been really great though. The one thing that many teachers don't like with parents is that they are allowed to give teacher ratings. They can rate the teacher 1-5 apples and also leave feedback. This feedback and ratings are on the teacher profile for other parents to see and read. Again, I've been so fortunate and have had nothing but good feedback but I've read on Facebook pages how brutal parents can be, don't want teachers coughing, touching face/hair, etc. and rate poorly for ridiculous reasons. The good news with that is that the teacher can submit a ticket to have the lesson reviewed and it can be removed from the teacher's profile if the rating is seen as unfair. Many parents won't even leave feedback. Parents are also given the opportunity to priority book over two weeks in advance so if you get a good base of parents who keep rebooking, you're booked well into the future. Have you had to deal with any technical issues while teaching with VIPKID? I've never had technical issues on my end other than occasionally there is a bit of a delay or I hear an echo but it's easy to just adjust your timing and deal with it for the 25-minute lesson. And yes, students have had technical issues multiple times. They try to do the lesson in cars from IPADs, which sometimes works, sometimes not. Most of the time if any, you just can't hear or see one another. There are live “firemen” who are always available for technical issues. The student or teacher can always at the press of a button notify them and they will immediately start checking and assisting. Usually, they can correct the problem. Anytime there is a technical issue not due to the teacher's equipment/connection they still get paid even if the lesson cannot continue. You're a full-time teacher with two super-active kids. When do you find time to teach your VIPKID students? So since we are central time, our schedule from what I've heard is the worst one but I find there is still tons of time before my kids wake up and after they are asleep to teach. Basically, you can open up slots around the clock but they do designate “peak” times. For central time it tends to run from 4 AM to 8 AM. Then still plenty of kids take from 8PM-midnight/2AM, Friday and Saturday nights to do overnight hours are peak as well. My typical schedule: wake up/shower/get ready for work and then teach one or two classes from 5-6AM then leave for work. I started out doing two classes in the evenings as well from 8-9 but then decided it was just making me too tired so did the mornings only. On weekends I would do 6-8AM and either Friday or Saturday night from 8-10. Like I said, there is a ton of time available. I just did what worked for my teaching scheduling and my personal life. Is there a lot of lesson planning required? No. This was hard at first for me because I like to plan and feel prepared. The company gives you basically power points to teach from. Below each slide are teacher/presenter notes with teaching points. Until I got familiar with all the different levels and the content, I spent too much time looking over the slides and some teachers like to pull props and plan rewards/incentives and some get really carried away. I kept it super simplistic and parents seemed to really like that. My focus was just on the child speaking good English. Some kids breeze through the lessons so you do have to have some other activities prepared to extend the lesson. I always just kept pictures or flashcards of objects and we would talk about them or my regulars I would just have a conversation once they were able to participate in conversational English. Once you get used to the timing and the content of the lessons there is very little prep time needed at all. I just kept a journal with me to jot down notes during the lesson because you do have to leave a bit of feedback at the end for the parent. Some teachers do all feedback at the end of the day, others do it in those three to five minutes between classes. If I was teaching regulars or lessons I was familiar with then I'd jump online literally five minutes before and be off three minutes after my last class. If I was teaching a course I was less familiar with or had many back to back lessons, I'd log in maybe 15 minutes early to view some of the slides and jot down notes ahead of time. Would you recommend VIPKID to other teachers? I would and have. Along with this, you get a $50 referral fee for teachers who are successfully hired that you recommend. This even goes up at times to $100. They really are always in need of teachers so they do big incentives with this. You get your own referral code to share. Is there anything else teachers who want to make extra money should know before they jump into this side hustle? Teachers sign six-month contracts and are re-evaluated each time the contract ends. Many have noted they wanted raises and do not get them. The company has sited that the parent feedback and rating system is part of getting a raise. Also, there is a huge network on social media of VIPKID teachers and so anytime you need help or have a question, there are tons of people to reach out to. The company is also really great at staying in touch. They put out weekly updates of information and email when anything comes up. The scheduling books two weeks in advance so this can be tricky in having flexibility in your personal life. You're only allowed six absences per contract and you are docked pay for them. The more time you give in advance when needing to cancel, the less the deduction is. You can also earn extra money by teaching what is called trial courses. These are classes offered to parents wanting to try VIPKID. If you teach a trial and a student signs up after their lesson with you, then you get $5. You are not allowed to have correspondence with families outside of your lesson. Many regulars want addresses to mail letters and small gifts, etc. back and forth but the company does not allow it. You can send little gifts or packages to VIPKID directly and they will send it to your kid/family but the process can take a long time. Overall, while it's not the highest side hustle wage, it is easy and convenient with little prep. If you're looking for a solid side hustle and meet the requirements of having a bachelor's degree and experience teaching children, VIPKID could be a great side hustle. Obviously, I've come across a ton of side hustles from running this site, and this one seems to be among the most popular right now. You can sign up for VIPKID here and get started with the application process. If you're a VIPKID teacher, is there anything else you can add here? This always struck me as a cool side gig. Get to help people out, experience a tiny bit of another culture, and all in the comfort of your home. Yeah, I’ve heard very few negatives about this side hustle. I think the most challenging thing might be some of the timing, but depending on where you live it seems very doable. I’ve heard some good things about VIPKid, but I’ve also heard that they can be tedious in their hiring process. I would consider picking this up as a side hustle if I needed to though, the pay seems amazing, especially when you think of how little teachers/tutors are typically paid! Honestly, if something crazy happened and M$M imploded, I’d pick it up. Pretty cool way to make extra money if you need to. Well, there’s lots to add as qualifiers to this interview…. Your friend must have been hired a while ago because the details of the interview process are different now. The substance is there, but this isn’t exactly the same now. Also, you cannot open hours around the clock. VIPKID allows teachers to open hours from 9am to 10 pm on Beijing’s time. Check those for your time zone, and realize that they don’t shift with our daylight savings. People sometimes go months without booking their schedule much at all. Patience is important, but new teachers can do things to get noticed earlier by parents. The referral program can be a big deal. I like to share my referral bonuses with my new hires. They pay enough to do that, and it’s pretty important to get someone to help you through the process. It’s a good paying job without much hassle or I wouldn’t do it. The cultural differences are noticeable sometimes though. Just understand that VIPKID is not bound by laws in the States. Cheers! Can you be more specific about the interview process and what’s different? I need to verify anything before I can change the review. My interview process was last July. My screening interview was by video with someone in China, not by phone. Then, my first mock class had both low and high level parts, and the company decided which one I was better suited for at that point. The second mock class was a full lesson in the level they chose for me. Both mock classes were done by naive speakers/teachers. I was hired at the end of October and this is my 4th week of teaching. My interview was by video with a man in China. Then I did a 10 minute demo. Next, I did 2 mock classes by video with 1 woman from Canada and another from South Carolina. I found the interview easy and the mock classes nerve racking. I spent hours prepping. Teaching the actual kids is much easier. I live in the Eastern time zone and the latest hours in the morning is 9am. I have been teaching 18 classes a week so far. If I worked earlier in the morning at 5am or even 4am I would have 40 classes a week. I don’t want that many and don’t want to work that early. However, the entire interview process has been overhauled in the last month. I would suggest going on the website to check it out. They are trying new ways to streamline the process and it is different for many people. So far I enjoy this a lot. It is easy to spend too much time prepping and too much money on props. It will cut into your overall pay. After 4 weeks I have cut my prep down to no more than 15 minutes for a new class to zero for a class I’ve taught many times. The Dollar Tree is the best friend of a VIPKID teacher! Thanks Becky! 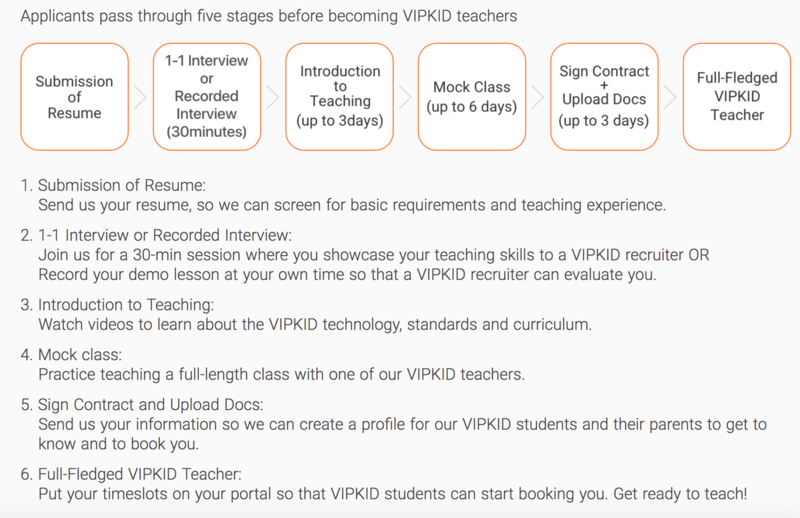 I checked with VIPKID about the interview process. They must be rolling out something slowly, because they told me what I had was fine for now. They mentioned that some teachers might have a slightly different process, but not everyone…I’ll keep checking with them until I get an official update! I might give this a try! Sounds pretty cool and it might even make you an even better teacher. Thanks for the tips!! No problem! I don’t see any reason to not give it a shot with all of the positive reviews I’ve seen so far. I’m a new VIPKID teacher. I’ve only been on with them for one full month, but I love this job! I typically teach 1-3 classes each morning before heading to my day job. I’ll open additional time slots on the weekends. It’s pretty amazing! Save 30%-35% and you should be fine (depending on your state). I am considering this as part time job once we relocate and I will be a stay at home mom. In terms of experience and highest pay rate, does having additional experience in sales/customer service online with foreign (Asian) clients help? My bachelor’s degree is also in Communication. Thanks! I would definitely make sure that those are included on your resume! Definitely won’t hurt.